When a person is on the mend or recovering from surgery or some type of illness it is important that they have things that can take their mind off of their physical condition. 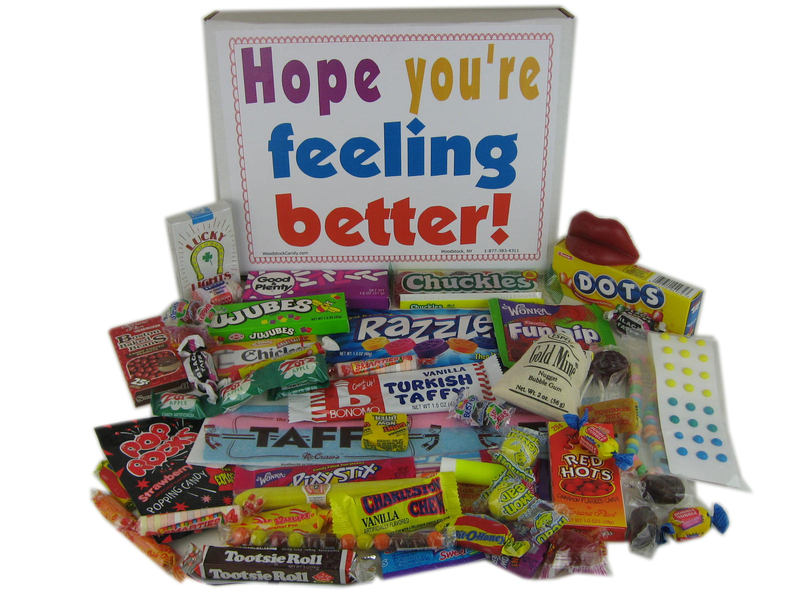 One sure-fire way to lift the spirits of anyone with a sweet tooth who is on the mend is to give them the gift of a candy get well basket. Even though it's loaded with sugar, candy is a favorite food item for many people and being able to eat candy they grew up with is a pleasing experience for those who are healing from surgery or illness.
. For the person who is lying in a bed recovering from surgery or illness the gift of a big container of candy items, especially old-fashioned candy products, can brighten their outlook and provide them with plenty of sweet-tasting treats. For older folks who are recovering from a malady, the gift of a candy get well basket filled with retro-style candy products can not only improve their outlook, but it can also help to create memories from when they were younger and used to eat those candies. One of the most popular types of candy get well baskets contains 40 different types of old-fashioned candy treats. Among the types of candy items that are included in this basket are bubble gum cigars, fruit chews, Turkish taffy, coated licorice pieces, chewy sour and cinnamon-flavored candies, straws filled with sweet and sour powder and novelty bubble gum. A special shrink-wrapped gift basket full of retro candy for people who have had back surgery is now available. This box is sure to bring smiles to the faces of those who receive it. Some of the candy items that are included in this box are Turkish taffy, powder-filled straws, novelty bubble gum, fruit chews and novelty fizzing rock candy. When a child is recovering from an illness or surgery, the gift of a kids' get well basket can help to make their recovery more pleasant. Forty different types of candy items are contained in this gift basket in a box. Bubble gum tape, chewy fish, hard candies, caramel pops, candy-filled straws, sweet dips, chewy chocolate rolls, lollipops, fruit chews, novelty bubwithble gum and sour balls are just some of the delectable candy items in this kid's gift basket.